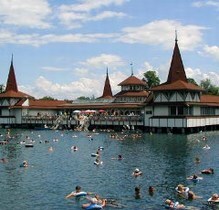 According to an old saying if you spring a well in Hungary sooner or later you will find thermal water. Geologist can confirm it by maps showing that underneath 80% of Hungary's scope there are thermal water resources warmer than 30 degrees. In Hungary there are numerous natural facilities on which medicinal tourism and wellness can be built: 1289 thermal sources, 39 spas, 5 medicinal caves, 48 approved mineral waters and 136 medicinal water sources, 4 silt quarries and 1 mofetta. The therapeutic effect of thermal waters enables a wide range of uses both in terms of prevention and treatment. The materials in the water are absorbed into the body through the skin, at the same time the body excretes certain materials and also during bathing the solutes in the steam over the water are inhaled. Thermal medicinal waters' typical indications are for locomotor, gynaecological, dermatological problems. The medicinal waters can be used not only for bathing but in case of disorders of the stomach, the intestines or the kidneys and also in case of certain metabolic disorders they can be used within the confines of a drinking course. Inhaling the steam of medicinal water is recommended against respiratory complaints. Thermal waters are rich in calcium, magnesium, hydrogen-carbonate, chloride, sulphate, iron, radioactive, also containing alkalis and a substantial amount of fluoride. EGER is a beautiful city with rich history and several monuments from the Ottoman occupation till the Habsburg ages. It has a minaret, large cathedral, a major fortress, a great library, a thermal bath, a wine growing area. (Szepasszony valley), and several nice excursion routes to the surrounding Bük mountains or Egerszalok salt hill spa. Eger's established hotel complex is situated in the town centre, only 500 m far from Dobó square, next to the Gárdonyi Géza Theatre. 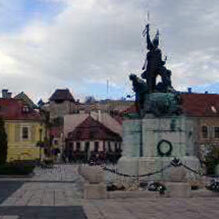 The Castle of Eger, other historic monuments and entertainment facilities can also be reached on foot. The nearby Bishopric Garden, which is the biggest park of the town, can also provide entertainment facilities. 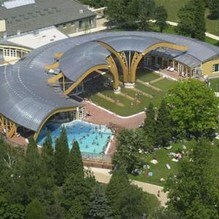 The Thermal Bath and the Turkish Bath, which is famous for its medical water, are right next to the park. Hotel services: An indoor swimming-pool, an adventure pool,a bubble bath, a sauna, different cabins (ice-, steam-, aroma-,light-,infra-, and salt cabins),a fittness room ,solarium body treatments, different massages. Electro-therapy (TENS, Iontoforezis, diadynamic), physico-therapy, electrical treatments, parafango, gymnastics. For those who would like to do some sport:table-tennis,bowling, darts,and at other places:tennis and squash. What is more:beauty shop, chiropody and manicure services. Address: H-4200, Hajdúszoboszló, Mátyás király sétány 21. Hotel with nice character and own heath section in a small street right next to the entrance of the world-famous spa, new wellness section with jacuzzi, stram bath, sauna, infra sauna, sun terrace. All rooms have french balcony. Free Wi-Fi is available in the entire hotel. Total no of rooms: 47 Hungarian specialties and international cuisine can be enjoyed in the restaurant of on the charming terrace. Address: H-9740, Bukfurdo, Europa ut 3.